Try A Luxurious Milk Bath Today! If you have never tried a milk bath before then you have really been missing out! Women having been taking them for thousands of years and with good reason. They are the easiest and most effective way to get your skin soft, smooth, fresh and radiant looking. What exactly is a milk bath? It is just very simply 2-4 cups of heated milk added to your bath, usually accompanied by a favorite scented essential oil. It's really that easy! milk powder. Milk powders meant specificly for bathing are available on line from skin care ingredient companies. What are the benefits of adding milk to your bath? Milk is so wonderful for skin because it is such an all-in-one natural ingredient. It soothes dry or irritated skin. The lactic acid and alpha hydroxy acid cleanses and exfoliates skin by dissolving the glue that holds dead skin cells together. The fat and protein in milk hydrates skin and helps it retain its moisture. Milk strengthens skin and instantly improves complexion and appearance. What other natural ingredients can you add with milk to your bath? Orange essential oil or any other fragrance you like is usually added because some people don't care too much for the smell of heated milk. I know I'm not a huge fan of it! Adding honey will add extra moisture to your skin if it's dry. Ground oatmeal can help treat dry, irritated or itchy skin and can be added to your bath. Epsom or sea salt can be added for extra exfoliating for rough, dull skin. For a list of essential oils that you can use in your bath click here. When having your bath, heat milk, but not to boiling point. Two to four cups of whole milk is usually enough. 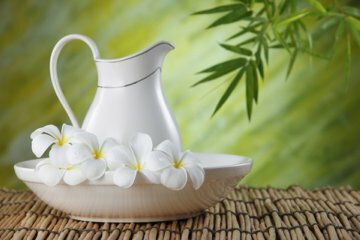 Skim milk does not have the fat or protein content that will moisturize your skin so it is not recommended for bathing. Add the heated milk to your bath after it has finished running along with oils and other ingredients. Be sure to mix things around before getting in to avoid hitting a patch of hot milk. You certainly do not want to burn your skin. Be sure to rinse away milk in the shower after your bath is finished. The only thing left is to soak away your worries, relax and get beautiful glowing natural skin! 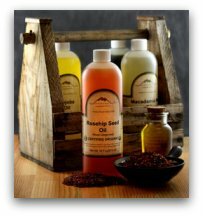 Visit Mountain Rose Herbs for all of your skin care supplies. Organic quality ingredients with very reasonable prices.